Please help and spread the word! Climate Justice at BC is getting attacked. Because of the repression and punishment BC students have faced, students, faculty, and community members outside BC planned a peaceful march and rally on April 12, meeting at 1PM at the BC green line stop. This is during BC’s admitted prospective students day. Special guests include Bill McKibben and Bob Massie. Climate Justice @ BC tried to work with the administration, as they always have, and have again been denied a permit. Worse, it now appears as though they will punish BC students anyways, even though most will not attend, and the students went out of their way to tell the administration about the action. Some CJBC members fear they may be expelled from school. Here’s the call to action with the sign up link and a history of some of the repression and punishment. On April 8th, a CJBC member met with Dean Mogan. The aim was to work with the administration, honestly and respectfully, as we have always tried to do. As you may know, the larger Boston climate justice community, as well as those concerned about the repression and intimidation of student organizers at BC, decided to hold a peaceful march and rally on April 12th, meeting at 1PM at the BC green line stop. We want to be clear, CJBC did not have to tell the administration about the event. We could have kept the event a secret, as we suspect outside groups would have preferred. Instead, we approached the administration and sought a permit. Unfortunately, the Dean of Students has again denied a permit to protest. This was done on the same grounds as past permit denials: CJBC is not a registered student organization and BC is concerned with liabilities. While we will continue attempts to work with the administration, CJBC has decided to withdraw our participation. Let us be clear, we are no longer affiliated with the event in any way. The action was never ours, but we wanted to be honest and transparent with the administration. As a sign of good faith, we let the administration know about this event which was organized by outside groups, and we are now being punished for that. Our attempts at working with the administration appear to have backfired: it now looks as though some CJBC members–those who continue to try and work with the administration–may face consequences regardless. We hope that is not the case. We had hoped we would be able to work with the administration. We are saddened that we won’t be able to attend collectively as CJBC. It means the world that the whole Boston climate justice community has been so moved as to come to our aid, and we deeply wish we could participate. However, to our knowledge, faculty, staff, students, and the larger Boston area climate justice community will continue to hold the rally on our campus. It is also highly likely that acclaimed activists Bill McKibben and Bob Massie will be attending and speaking. We hope those coming to stand in solidarity with climate justice organizers are not treated with hostility. If you choose to attend, you do so at your own risk. In all likelihood, it appears as though BC may lockdown what is typically an open campus. We are aware of the irony in preventing faculty and students, mothers and fathers, ministers and community allies from entering campus, when they are only seeking to demonstrate for the basic rights of students and the urgency of climate justice. Nevertheless, this is the situation. Support BC and Divestment through the Divest Fund! 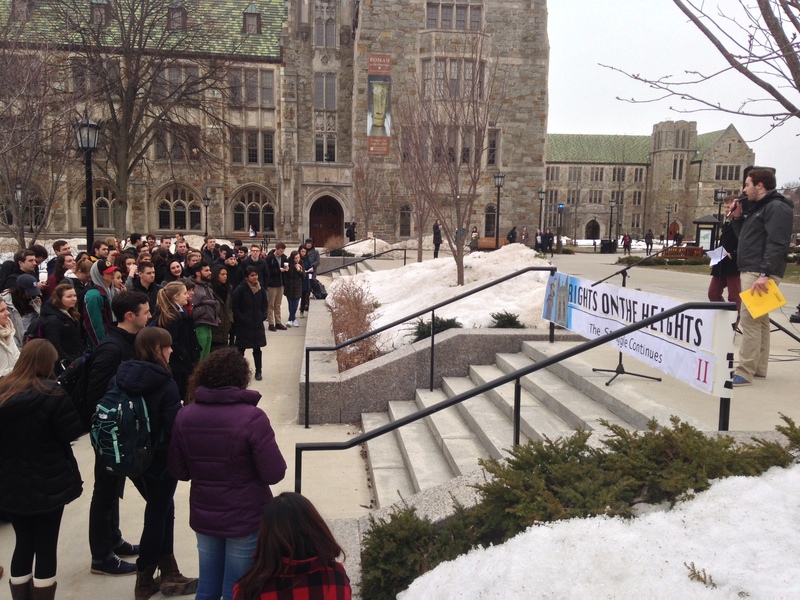 Boston College students host their second “Rights on the Heights” rally in protest of aggressive oppression of students from the university administration. This protest follows on the heels of the first rally, which took place three months ago in December 2014. Developments since the first protest have included new rules from the administration that further limit the ability of students to secure permits for protests along with punishment of student organizers of recent events, barring some students from applying to study-abroad programs. Rights on the Heights II: The Struggle Continues. Zack Muzdakis gives opening remarks to over 100 students gathered on campus. Read more about “Rights on the Heights II: The Struggle Continues” in the front-page BC Gavel article here. Intervention: It is Time for BC to Break Up with Fossil Fuels! Kickoff of the rally>march>vigil is here. 15 seconds of song here. 15 seconds of chant here. On February 13th, 2015, undergraduates, graduate students, and alumni gathered outside O’Neill Library and marched to President Fr. Dr. Leahy’s main office, as part of a call for Boston College to withdraw its investments from fossil fuel companies. Organized by the group Climate Justice at Boston College (CJ@BC), this action was carried out in coordination with climate justice organizers for Global Divestment Day, calling for a Valentine’s Day “breakup” between BC and the fossil fuel industry. The day of action follows Thursday’s at the Massachusetts State House and at Harvard. This global coordination of action displays the growth of divestment campaigns and their increasing pressure on decision-makers to stand for a stable climate and a just economic system. CJ@BC joins thousands of students across the country who are calling for their respective universities to divest from fossil fuel companies that have polluted the scientific process, our democracy, and our communities. Before the vigil, students gathered in front of O’Neill library for a kick-off call and response. 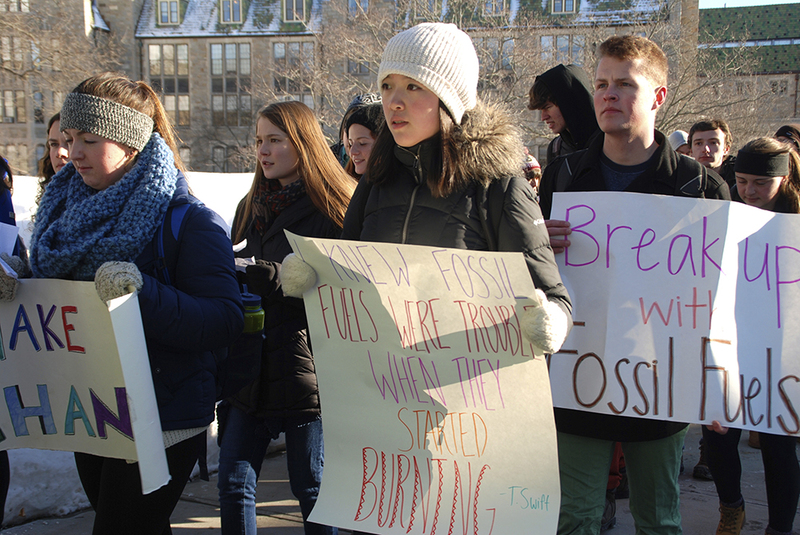 Alyssa Florack (‘17) described the destructive relationship Boston College maintains with the fossil fuel industry, and called for a breakup, “A long time ago, BC began its investment relationship with fossil fuel companies. They were making tons of money, and BC was happy. Or so it thought. Eventually, the affair started to heat up, and that’s when BC found out about global warming. Despite institutional pressures to maintain the status quo, many are realizing the dangerous consequences of this relationship. And the relationship doesn’t just hurt BC; it hurts all of humanity.” BC’s investments in the fossil fuel industry are not only unethical, but also risk the futures of the students the college claims to be educating to “shape the future”. After the rallying speech, students marched to McElroy and down College Road to Botolph House. During the march, students sang rewritten verses from Kelly Clarkson’s “Since U Been Gone” and Lady Gaga’s “Bad Romance,” playing on Valentine’s Day and repeating the call for BC to “break up” with fossil fuel companies that perpetuate climate chaos. The group of 45 were respectful, peaceful, and in high spirits, reflecting hopes for a better future. Students held signs with phrases like “It’s not me, it’s you,” “Pick a side” (with Boston College pictured on one side of a broken heart, and the Koch Brothers on the other), “This is an intervention,” and many more. CJ@BC has been organizing for over two years, calling on Boston College to stand for climate justice. In addition to divesting from fossil fuels, CJ@BC has been calling for more investments in renewables and efficiency, as well as more climate-related programs that would generate student-faculty collaboration and prepare students for work in burgeoning fields. New York City — Two days before today’s UN Climate Summit 400,000 people made history on the streets of New York City – joining together to take part in the largest march ever on climate change. But world leaders continue not to listen. They’ll take their photo opportunities in the street, but refuse entrance into the actual halls of power. Today, the Climate Justice Alliance attempted to bring a statement from the people to world leaders, but were refused entry. Community voices were silenced, even while frontline climate-devastated communities and the 400,000 others who marched on Sunday called for climate action that works for Main Street, not just Wall Street. The exclusion of community members who live on the frontlines of the climate crisis show that today’s climate decision-making arenas have been taken over by a corporate agenda that prioritizes destructive profit driven policies over the wellbeing of families, workers and communities. “Those within the UN Climate Summit need to start thinking about ways to change people’s relationship to the earth, ways to change the definition of prosperity and well-being to something that’s not about money for a few people, but for a good livelihood for everybody,” said Jihan Gearon of Black Mesa Water Coalition on the Navajo Nation. For decades, frontline communities have been cultivating real solutions that move away from an economy of endless growth that exploits people and nature to one that links climate change and human rights, recognizes the rights of Indigenous peoples, and the self-determination of frontline communities. “We demand that world leaders support and move money to our community-led priorities and local infrastructure needs to build sustainable community economies, energy democracy, zero waste, food justice, public transit and affordable housing – pathways that can create millions of long-term jobs and put our communities back to work,” the Climate Justice Alliance said in the statement they attempted to deliver to world leaders. This Sunday, over 400,000 people marched on the streets of New York City in solidarity with communities around the world living on the frontlines of both climate change and the exploitative systems driving this planetary crisis. Thousands more took direct action yesterday by “Flooding Wall Street” to target the polluting corporations and their financiers profiteering from such global harm. Today, as world leaders gather at the United Nations Climate Summit 2014, we – members and affiliates of the Climate Justice Alliance—duly note that these climate arenas are taken over by a corporate agenda that continues the onslaught of business-as-usual, the global expansion of fossil fuel development rather than action to cut greenhouse gases at source. In place of genuine climate action, the UN Climate Summit 2014 is little more than a pep rally pushing carbon trading offsets and weak voluntary or limited pledges for emission cuts leading up to the global climate treaty negotiations in Paris next year. Today, UN Secretary General Ban Ki-Moon stated a goal to achieve carbon neutrality by 2020. On the surface this appears good. In reality, it is thinly veiled language for the promotion of market-based and destructive public-private partnership initiatives such as REDD+, Climate-Smart Agriculture and the Sustainable Energy for All Initiative – which will further exploit human and natural resources to expand the profits of the world’s most wealthy. As communities first and most impacted by the storms, floods and droughts, we are also at the forefront of the fight against the pollution, the poverty, the police violence, the land grabs, the water shutoffs, the forced migration and the human rights violations symptomatic of the climate crises. Which is why our communities are uniting for a Just Transition away from the “dig, burn, dump” economy and towards local, living economies that meet the material needs of people and where communities and workers are in charge. For decades we have been cultivating real solutions where we live, work, play and pray. Our solutions define a new system that moves us away from an economy of endless growth that exploits people and nature to one that seeks harmony between humans and nature. We need a system that links climate change and human rights; that recognizes the rights of Indigenous peoples and the self-determination of frontline communities. Our planet, Mother Earth, and her natural resources cannot sustain the increasing greed, consumption, extraction, pollution and waste associated with the 1%. We require a new system that addresses the needs of the majority and not of the few. To move in this direction, we need a redistribution of resources and a new definition of wellbeing and prosperity for all life on the planet in recognition of the limits and the rights of our Mother Earth and Nature. We demand that world leaders support and move money to our community-led priorities and local infrastructure needs to build sustainable community economies, energy democracy, zero waste, food justice, public transit and affordable housing – pathways that can create millions of long-term jobs and put our communities back to work. We support Indigenous peoples, our brothers and sisters of the North and the Gobal South, in their climate justice struggles linking land and water rights, land title and the full implementation of the UN Declaration on the Rights of Indigenous Peoples. Sunflowers serve to remove harmful toxics from the soil, while providing nutrients and shelter for animal life above ground. We present these sunflowers to the global leaders at the UN Climate Summit as a symbol of the community-led solutions we are growing.